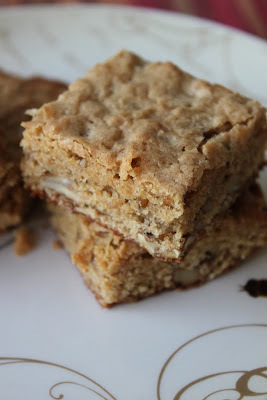 For my second recipe for the King Arthur Project, I decided to take on the bar cookie. 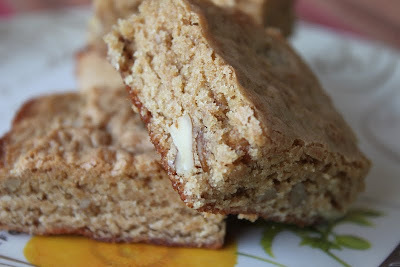 I was really anxious to see how whole wheat would taste in one of my favorite traditional recipes, the blondie. The blondie is the one bar cookie that I know will please everyone in my family so to be able to add whole grains to the bars was a bonus. This recipe is from King Arthur Flour's Whole Grain Baking and I used KAF Whole Wheat Flour in the batter. Results: I was pleased with the results in both flavor and texture. 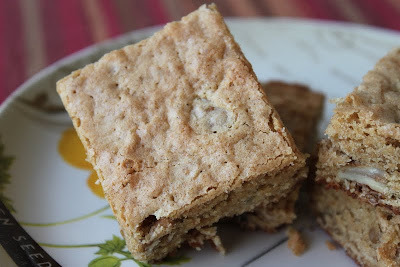 With the first bite, I immediately identifed the flavors of brown sugar and butter, the main components of blondies. The blondies had the same texture as blondies made with regular flour. I added some butter-nut flavor to the batter, but I'm not sure if it was necessary. I think there would have been enough butter and nut flavor from the butter and pecans used in the batter. To make these even more decadent, you could add some toffee bits or a scoop of vanilla ice cream on top. Preheat the oven to 350 degrees. Lightly grease a 9 x 13-inch pan. Bake the blondies until the top looks shiny, 26 to 28 minutes. Don't overbake; bake just until the edges start to pull away from the sides of the pan and a sharp knife tip poked into the very center reveals sticky crumbs but not wet batter. Remove from the oven and run a knife all around the edge of the pan; this will keep the blondies flat as they cool, by allowing the edges to settle in the pan along with the middle. Cool completely before cutting. If you prefer squares with a very smooth texture, wait 24 hours before cutting; this waiting period gives the bran in the whole wheat time to soften up. I always let my bars set overnight before cutting them and I did so with these, too. These cut smoothly and easily. So, I really appreciated seeing that tidbit written in the directions of the recipe. King Arthur Flour does a great job at giving you directions and then explaining the reason for the directions. It's more than a recipe, it's a baking class! For those of you who want to take the baking journey with me, there is help for us all. King Arthur Flour has a Baking Hotline with wonderful experts who can help us if we have recipe questions or get stuck with something. Call (800.827.6836), email (bakers@kingarthurflour.com) or even chat live online (http://www.kingarthurflour.com/)! Let's enjoy the bread journey together! 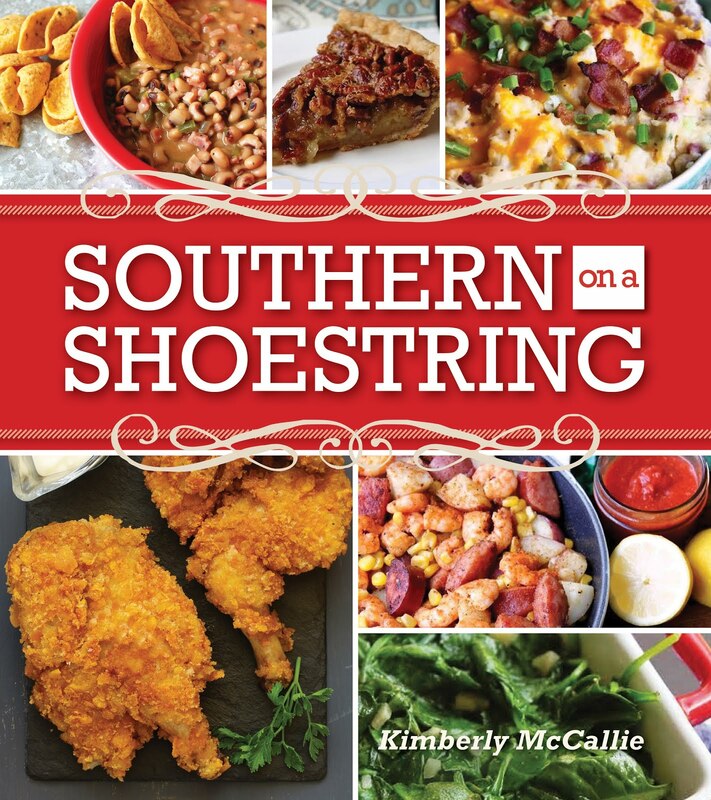 Oh Kim these look amazing & I love the fact that they can be made with whoe wheat flour! Great recipe, but I have to say when I saw the title, I thought you had done them with butternut squash. LOL! Now those would have been really healthy. Ha! I must try these. I love bars like this. They look amazing.